Most medium and long-term loans are no longer secured by sovereign or governmental guarantees. As a result, lenders must seek security elsewhere. An investor-friendly climate requires a sound legal framework for lenders to effect and enforce secured transactions. The editors provide an invaluable service in bringing together in a single resource those texts which make a significant contribution to the development of scholarship in this area. 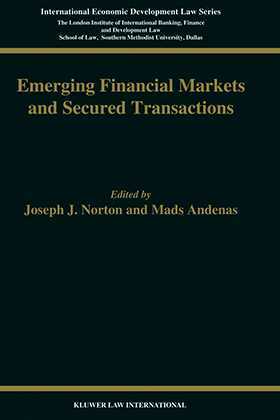 The work emphasises the importance of the development of a modern framework for secured transactions. Academics and practitioners will appreciate the expert contributions and multi-disciplinary approach.